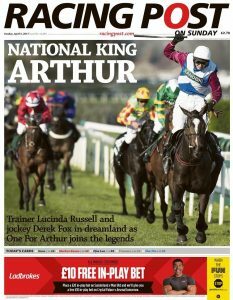 We were all very proud when One For Arthur made history on Saturday afternoon for owners Belinda McClung & Deborah Thomson and trainer Lucinda Russell becoming the first Scottish based winner of the Grand National since Rubstic 1979. He benefited from a lovely patient ride from Derek Fox who overcame a broken wrist and collarbone as little as one month ago. Tribute should be paid to the Injured Jockeys Fund and in particular Jack Berry House in Malton for the outstanding effort to get Derek back race riding with 3 days to spare. 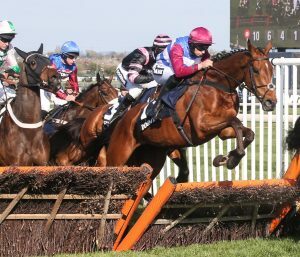 We purchased ‘Arthur’, a son of Milan at Cheltenham Sales on behalf of his new owners (The Two Golf Widows) and Lucinda Russell for £60,000 after a succesful point to point outing at Lingstown in November 2013, his 5th start. It’s amazing to think looking back that he and Blaklion met for the first time that day. Who would have thought they would jump the last fence together in a National three and a half years later? 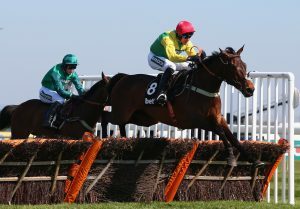 Less than 3 hours earlier, Finian’s Oscar returned to the track after missing Cheltenham due to a minor foot infection and took his second Grade 1 victory for Ann & Alan Potts and Colin Tizzard since being bought after winning his sole point to point outing in October. The progress this horse has made over the winter is staggering and one can only be excited by the way he jumped and won after the inexperienced way he travelled throughout the race. We bought The Worlds End privately after he had fallen attempting to make-all in a 4yo point to point. This son of Stowaway was quickly snapped up from us by Tom George for his new owners The McNeill Family and since winning his bumper impressively has continued to do nothing but improve. 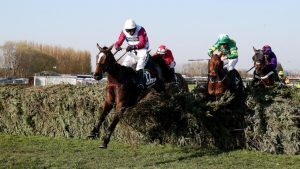 When he fell 3 out in the Albert Bartlett at Cheltenham we were all of the opinion that he would have gone very close so it was great for all involved in the horse to be justified when was rewarded with the Grade 1 spoils here. Another emotional story to emerge last week was that of Lalor, a horse we bought from the Derby Sale in 2015 for €16,000, a fine stamp of a horse by It’s Gino (Group 2 Winning middle distance German Sire who was beaten only 2 &1/2 lengths in the Arc by Zarkava). We brought him home for 6 to 8 months to be broken and sold him in the yard to Westcountry trainer Richard Woollacott who shared the enthusiasm we had for the horse, he took him home and sold him at his annual owners day to Dave Staddon. 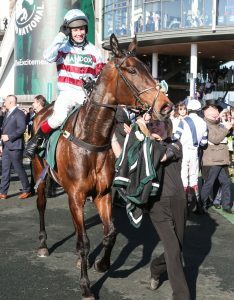 All he has done in his 4 bumper runs is improve and added to his 13 length win at Wincanton by striding away at Aintree under Richard Johnson to lift a first Grade 2 race for the South Molton based team. In a difficult week for the yard since the sad death of amateur jockey James McNeile they deserve every success. Our condolences to his family. 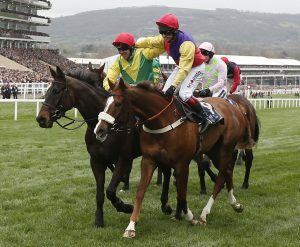 The Cheltenham Festival is always a very difficult place to win and this year’s was no different. Plenty of horses from various yards ran very well, most notably Native River who got within 3 lengths of the biggest prize of all in the Gold Cup run in front of a packed house. 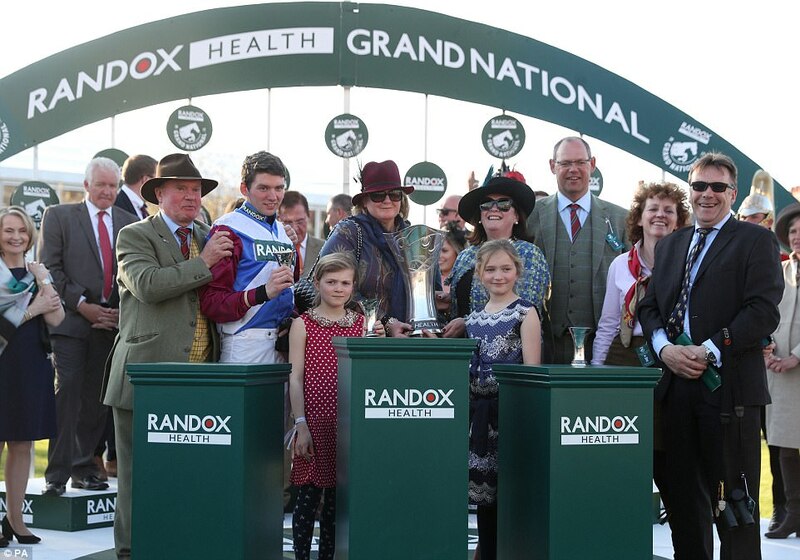 He has been an absolute revelation this season for Garth and Anne Broom, his first out of novice company, by taking the Hennessy, Welsh National and Denman Chase. He has earnt a good summer’s break now and we dare to dream about next season. I wanted to include this photo of these two pulling-up strides after the line which epitomises the sporting nature and camaraderie which flows through our great sport.